So after a bit of a hiatus from making any personal art, I thought it was about time I got back in the saddle – and what better source of inspiration than Breath of the Wild, the eye-poppingly beautiful and terrifyingly vast new Zelda title that’s managed to slurp up every spare second of my free time since the moment it dropped through my letterbox? The sprawling nature of the game was the perfect excuse to work in a bit of background – something that usually slips my attention once I’m done with the character art. I actually regret how little of the landscape I was able to include. It was a lot of fun shading in the crags and ridges of Death Mountain, and splattering out lava with a brush and ink, and I think Hyrule Castle looks appropriately ominous in silhouette. 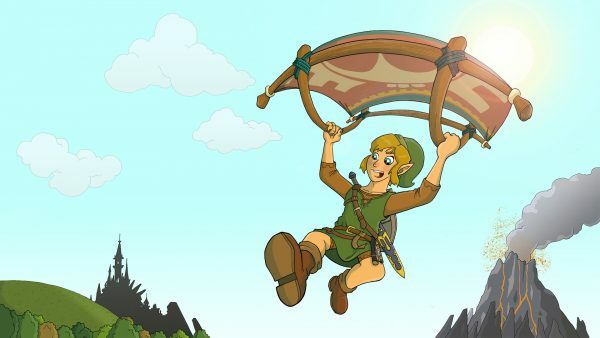 If I were to draw from this game again, I would certainly take the focus away from Link and feature as much as possible of the semi-post-apocalyptic wilderness he inhabits.